My last 5 nights in Denali NP were spent at Teklanika cg, 29 miles into the park. Once at the campground you are not permitted to drive around until you leave. In order to travel I purchased a pass, called a TEK pass, that enabled me to hop on any shuttle and go as far as the Eielson Visitor Center which is a 6 hour round trip. That was as long as I wanted to be away from the dogs and provided many photography opportunities. The bus drivers would stop for wildlife viewing whenever possible so it worked out very nicely. 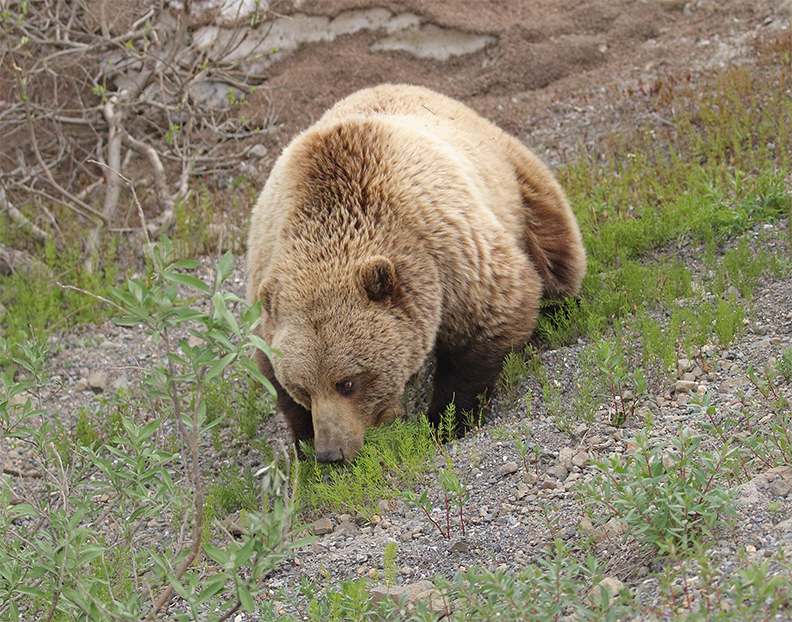 I got to see many grizzly bears, some were simply too far away that while I took photos I won’t upload them. Others are closer to the road and were great subjects. I saw this bear 3 of the 4 trips out, and sometimes 2 times a day, on the way out and on the way back. I did include a couple of images of a sow and her 2 cubs laying out in the grass enjoying a sun bath simply because they looked so utterly relaxed. For the most part I saw sows with 2 cubs, some were born this past winter, others appeared to be 2 or 3 years old. This was the only single bear I got some good images of and it was fun to watch. The last few days have been great for viewing the bears, but it is getting wetter and wetter, raining more often and for longer periods. Fortunately the bears don’t mind and we humans cope because the rewards are worth it. Thursday I left the creek around mid day for a couple of hours, so naturally a wolf decided to come along and see what scraps were available. Friday at the creek we saw no bears from early morning through about 2 pm. I had to leave then and returned about 4 pm. The wolf returned about 4:30! After that a couple of the grizzlies returned and for a while there the sow was in one area and one of the boars in another. We could see both,but not without turning a bit to do it, and were waiting to see if she spotted him. We were hoping she would stand up, but she never realized he was there. Oh well, these are wild critters and totally unpredictable! It’s really raining here this morning so I decided to drive to the little local library to make use of their faster wifi to get some images uploaded to my website, catch up on email and this blog. While I’m here I may even check the weather report.